NINE-SIXTEEN - Amethyst Squatty Vase. 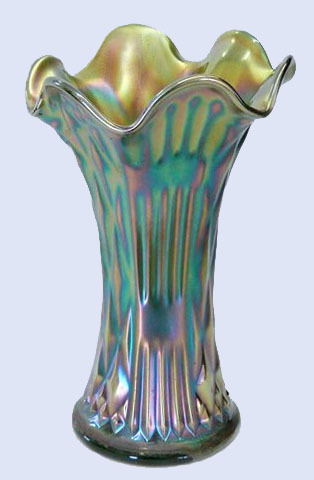 NINE-SIXTEEN Vase: Many of these vases are 15-16” in height. Short versions such as seen here, are not so easily obtained. Among the many vases produced by Fenton, this particular pattern is a bit elusive overall! Amethyst, blue, green and marigold, along with a white example which sold over eBay, comprise the range of colors known. CHERRIES Banana Boat in Blue - (RARE). FENTON CHERRIES: Banana boat shape about 9 ½” long, these are so scarce/rare that many collectors do not realize they exist! Three or four blue bowls with plain interior and a marigold example having a floral interior are the only ones known. Tom Burns sold a blue one in 1998 for $2,700. GRAPE & CABLE Fruit Bowl - Vaseline. GRAPE & CABLE-Persian Medallion interior: Amethyst, blue, green, and marigold are the prime colors found in these fruit bowls. The Vaseline base glass is somewhat unusual…….and desirable! Small Size GRAPE & CABLE - Amethyst. GRAPE & CABLE-Plain interior: Amethyst, blue, green, and marigold are the basic colors for this version, as well. 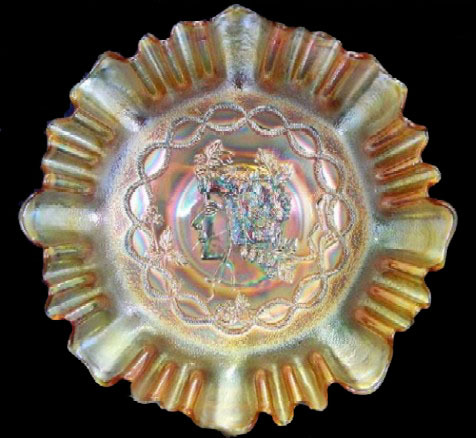 The amethyst examples having the handle have been around as long as we have pursued carnival glass, but that handle was NOT applied when the bowl was made! Just how many there are is not known. The handle is not the same shade of glass used for the bowl. Several suspected “make-over-artists” have passed away during our collecting years. Any one of them may have been responsible. We saw the first such “extreme makeover” as early as 1975. Spring 1915 Butler Brothers Wholesale Catalog. Left-10.5 in. Cobalt Blue CHRYSANTHEMUM Bowl.Right-11 in. Green. 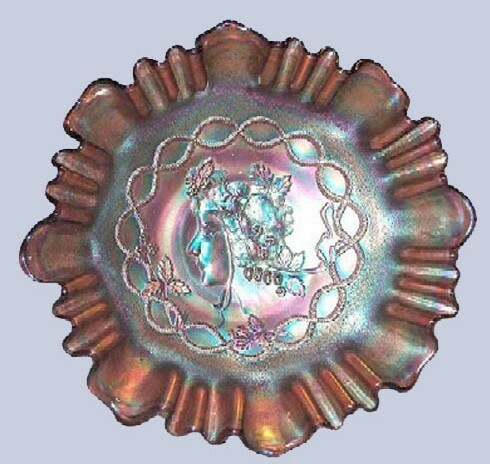 CHRYSANTHEMUM 10”-11” Ball Footed bowls: These two examples are the epitome of “Iridescence IS the Essence”! 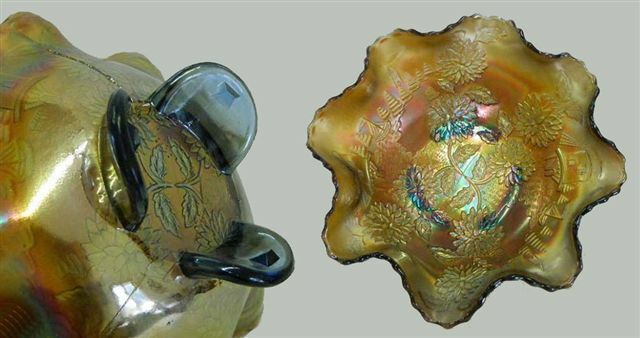 We should mention the fact that on rare occasion, a marigold rosebowl shape is found in the pattern. Powder blue spatula footed Chrysanthemum - 8 inch. CHRYSANTHEMUM Spatula Footed 8” bowls: These seem rather scarce when compared to the larger bowls in this pattern! They are known in Amethyst, powder blue and marigold. White IC shape 10 in. CHRYSANTHEMUM is possibly only 1 known. CHRYSANTHEMUM Marigold & White bowls: Ice cream shaped bowls are known in blue, electric blue, green, marigold, red/oxblood and possibly a couple of white bowls. One is shown and another has been “reported”. Red Chrysanthemum - 11 inch. 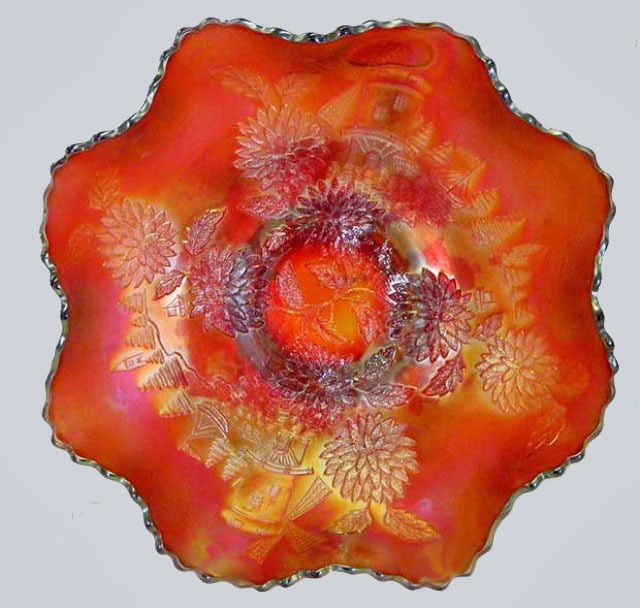 CHRYSANTHEMUM Red Bowl—10” ruffled: This is an exceptionally nice ruffled, red bowl! Depending on depth of ruffling, these can be nearly 11” in diameter. Amethyst, black amethyst, blue, green, lavender, lime green, marigold and vaseline are also known colors in this size. GODDESS of HARVEST - Amethyst. GODDESS of HARVEST in only known Blue example, along with Amethyst. GODDESS of HARVEST: This is one of the most sought after Fenton patterns and never fails to bring large sums of money! We can find no evidence of production within the Butler Brothers Catalogs. Bill Edwards’ 1991 3rd Price Catalog revision states that he had heard of perhaps five examples. The only known blue bowl shown here displays the tightly crimped edge. Other known colors are amethyst and marigold. These may display the ice cream shape, 3/1 edge or have six ruffles. Considering the likelihood of fewer than ten examples overall, we are left with the possibility that they were “salesmen’s samples”; possibly with a higher price tag than the average Fenton pattern, since the human face is portrayed. Perhaps no orders were taken, nullifying production? 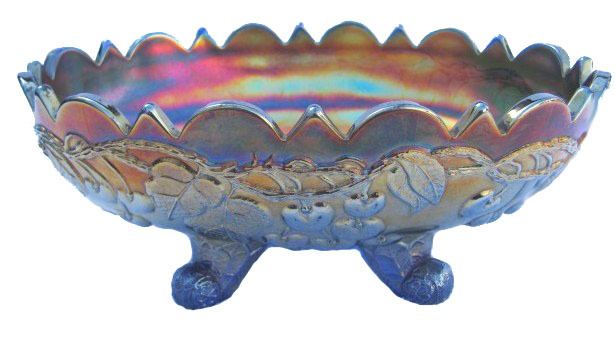 Blue CRE bowl - only blue bowl in any shape reported, sold in Sept. 2014 for $52,500. 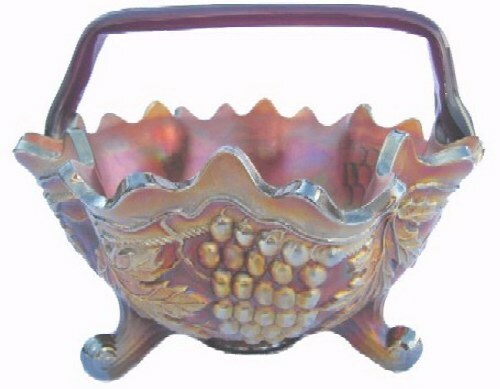 Amethyst CRE bowl - one of two known, sold in Sept. 2014 for $25,000. 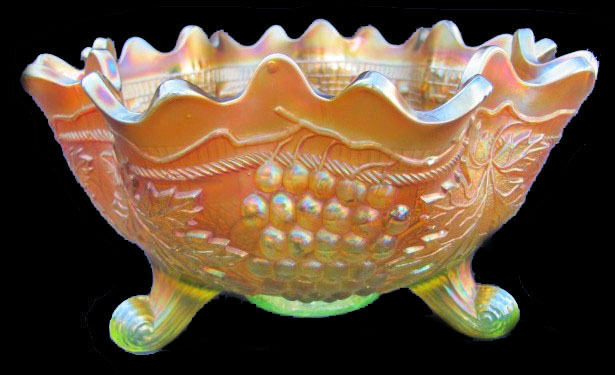 Marigold ruffled bowl - one of three known, sold in Sept. 2014 for $6,000. nor extortioners will inherit the kingdom of God. And such were some of you. but you were justified in the name of the Lord Jesus Christ and by the Spirit of our God.